A blunt knife is a dangerous knife – because you will find it hard to control and manipulate. If you’re a cook and you use knives regularly (of course you do), you should also have the best sharpening stone nearby to keep your cutting tools in tip-top shape all the time. I have prepared this guide for you to help you understand the uses and benefits of a ﻿﻿﻿sharpening stone. By knowing how it works and how to use it, you will be able to sharpen different types of cutting tools safely. 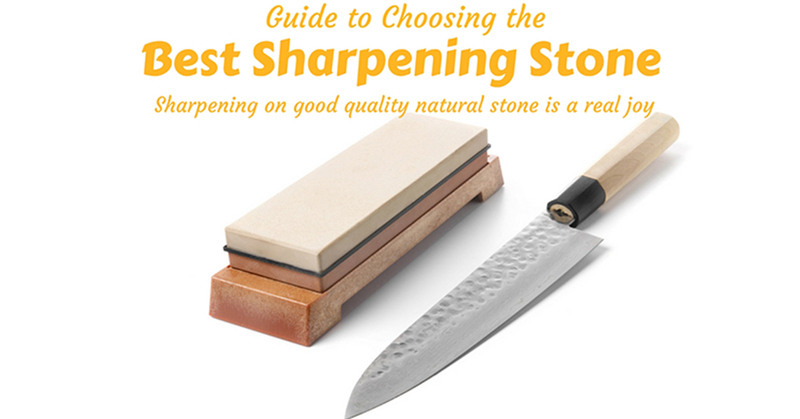 Which Sharpening Stone Should You Go For and Why? You know how a sandpaper works, right? Well, a sharpening stone works just the same – it works like a sandpaper in polishing metals. In place of the scrubbing motion of a sandpaper, however, metal blades need to pass over the stone in a slicing manner to sharpen them. 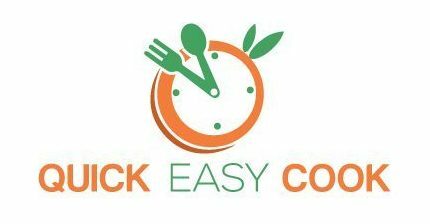 Those with coarse grits can cut through metal faster – and therefore sharpen knives faster as well. Those with fine grits are mainly used for polishing and finishing touches. There are soft and hard types of sharpening stones. The soft types can sharpen and cut faster than the hard types as new abrasive materials are revealed when the surfaces of a sharpening stone begin to wear out. Lubricants are needed when using sharpening stones as debris from metals can hinder the cutting process. Oil or water can be used as lubricants (this will depend on the type of stone). 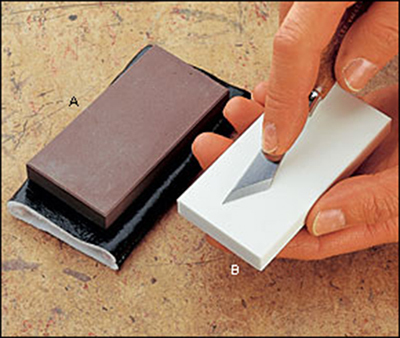 This section will discuss the 4 basic types of sharpening stones. There are 2 types of water stones – natural and synthetic. Japanese water stones fall under the natural category, and this type of sharpening stone is quite expensive. The synthetic or unnatural stones are less expensive. Since water stones are soft, they can wear out and become uneven faster. This doesn’t mean that they’re already ruined, however, as the surfaces of sharpening stones can be flattened again. Using another sharpening stone can easily fix the problem – and a Diamond sharpening stone can be used for this purpose. Click here to watch a video on how to flatten a sharpening stone. Oil stones are called as such because they need oil as the lubricant when sharpening knives and other cutting tools. These sharpening stones come in different grades, so you can choose from a course, medium, and fine grits. Your choice, of course, will depend on your goal and what you’re trying to achieve in sharpening your tools. Ceramic sharpening stones are named as such because they are made from ceramic powder combined with Aluminum oxide. Because of its composition, little to no lubricant is needed when using this type of knife sharpener. Industrial-grade diamonds (not those used in jewelry) are used in a diamond honing stone. While it’s also a type of sharpening stone, the diamonds are actually attached to a plastic or metal plate. As diamonds are hard, this type of sharpener can cut and sharpen metal blades very fast. 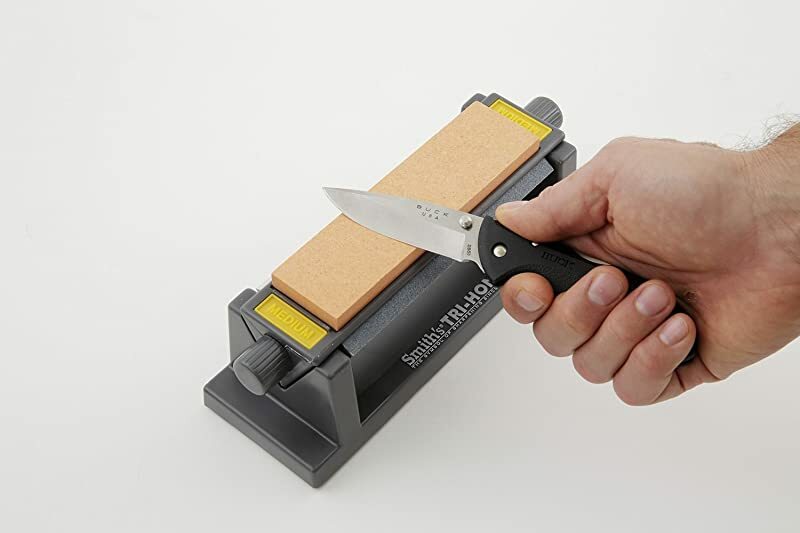 A diamond knife sharpener is also more durable than regular sharpening stones. So, as can be expected, this is also the most expensive type of stone sharpener. The use of lubricant is not needed in a diamond stone knife sharpener. You see, there are holes on the surface of the plates – those are enough to keep metal debris from hindering the sharpening process. There are 3 types of s﻿﻿h﻿﻿arpening stone grits – each one is described below. Coarse Grits – These usually carry 400, 600, and 800 grits. Course grits are able to cut through metal quickly – that’s why they are best used on dull and damaged blades. Medium Grits – These are used to polish and finish off work after using a course grit sharpener. The grit level for medium grits is 1,000 to 2,000. As a 2,000-grit sharpener can already be considered fine, this can produce a very sharp blade when used as a finisher. Fine Grits – Grits with 5,000 to 8,000 grades fall under the fine grits category. Such fineness is useful in sharpening and polishing hard types of blades. Note: A really thorough sharpening procedure involves the use of course, medium and fine grits (in that order). Step 1 – Selecting the proper coarseness of grits. You need to use a course grit sharpening stone to work on very dull or damaged blades. Medium to fine grits can work for slightly blunt blades and tools that only need minor touch-ups. Really fine grits are used for polishing and really sharpening the edges of blades. Step 2 – Application of Lubricant (if needed). Floating swarf (or metal debris) will hinder proper sharpening of blades – that’s why oil or water is used in some types of sharpening stones. Step 3 – Selecting the Angle. This is an important part of sharpening blades as the wrong angle can either ruin a blade or cause uneven sharpening. Ideally, the angle should be anywhere from 10 to 30 degrees – so, aim for a 20-degree angle to maintain proper balance. Step 4 – Sharpening the Blade. Once you have the right angle positioned, start sharpening the blade by making a slicing motion over the sharpening stone. Perform this action on both sides of the blade – and for best results, sharpen both sides alternately. Don’t store wet sharpening stones as they can get moldy. Allow them to air dry for a long time as the insides can still be wet even when the outside portion is already dry. Nabbing the number 5 slot in the Top 5 Best Sharpening Stones list is the Suehiro Japanese sharpening stone. Look closely into its features and design and consider buying one for your knife sharpening needs. Size – This particular unit measures 5x1.5x1 inches. It’s 5 inches long, 1.5 inches wide, and 1 inch thick. Double Sided Design – The 2 sides of this model can be used for sharpening knives, scissors, and other types of cutting tools. 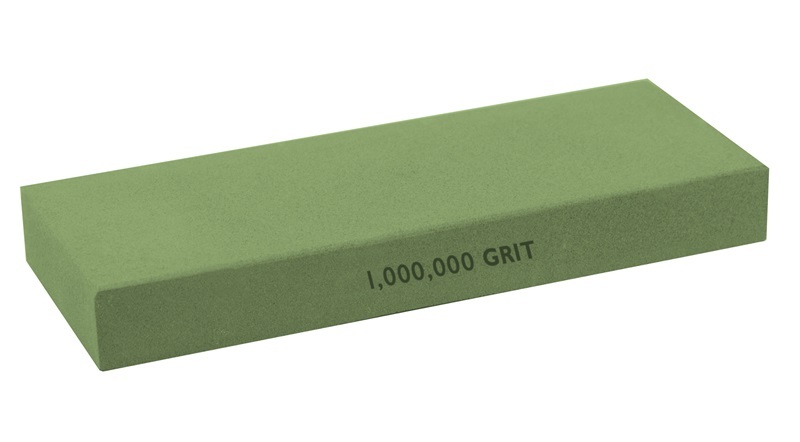 Grits – If you get this sharpening stone, you can use the 1,000-grit side to sharpen dull knives. The 3,000-grit side can then be used to polish and finish the sharpening process. Compact Design – It’s a small sharpening stone that’s easy to carry anywhere. Stand – A platform or stand is included in the package. It comes with a rubber base to prevent slipping while using it. It’s small and portable – you can take it along with you outdoors. It requires the use of water, which is more economical than oil. It’s too small. The size may not be enough to accommodate regular-sized kitchen knives. The quality is not that high – the stone easily chips with constant use. The combination of sharpening and finishing is not ideal for really blunt and damaged knives. Moreover, Both 1,000 and 3,000-grit sharpening stones can actually be used for finishing touches. 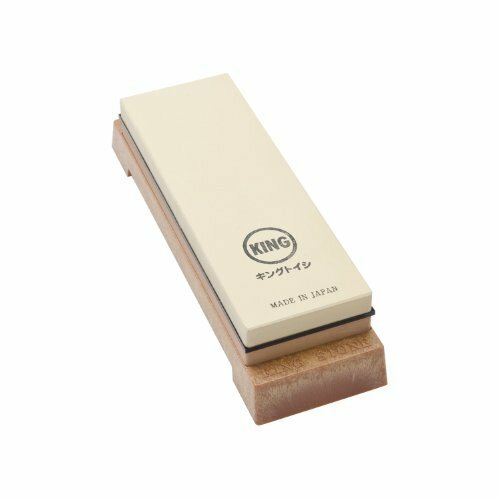 Since this is just a small sharpening stone, it is only useful for sharpening short knives and other cutting tools. You can consider this model for small jobs and its compact design also makes it ideal for outdoor use. 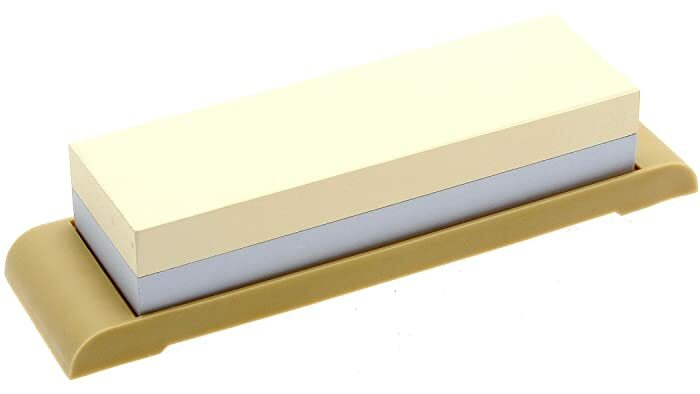 For a reliable sharpening stone that you can use for a long time, considering buying this Whetstone knife sharpener. Size – This sharpening stone has a measurement of 7.25x2.25x1 inches. Its length is 7.25 inches, its width is 2.25 inches, and its thickness is 1 inch. Non-Slip Base – It comes with a stand or platform that’s made of bamboo materials. This will hold the sharpening stone securely on any surface. Angle Guide – A piece of slip-on angle guide is included in the package to maintain the correct angle while sharpening knives. 2-in-1 Design – The 1,000/6,000 grit combination allows you to sharpen, smoothen and polish your cutting tools. 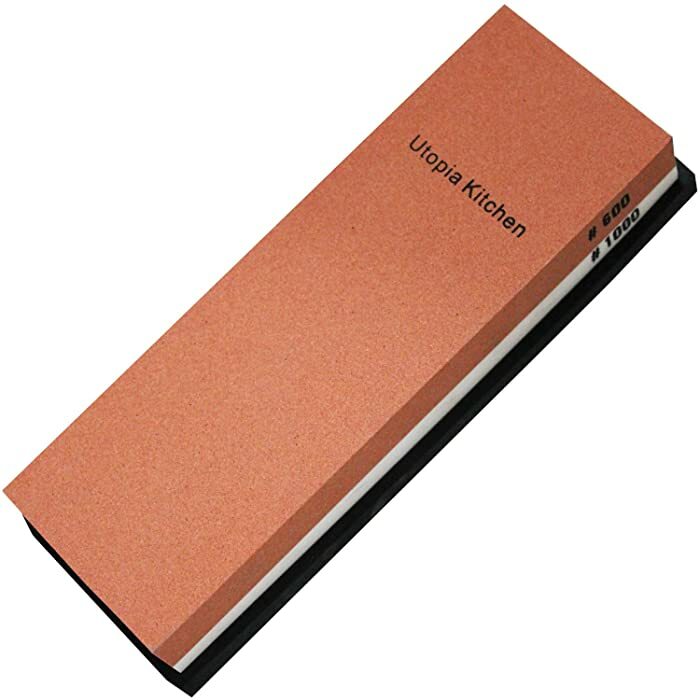 Aluminum Oxide Materials – This type of sharpening stone needs to be sprinkled with water during use. It also requires being soaked for about 5 minutes before use. 1,000/6,000 is a good grit combination as the difference allows for flexibility in sharpening and polishing knives. The included angle guide is a great tool for beginners. Since it only requires the use of water, sharpening cutting tools will not be very messy. The included stand is not that good. To make sure that it’s stable, put a towel under it. The angle guide is not intended for long term use. It can wear out easily. If you intend to really sharpen your cutting tools, this model would make a fine choice. The 6,000-grit is so fine that it’s capable of producing really sharp edges. 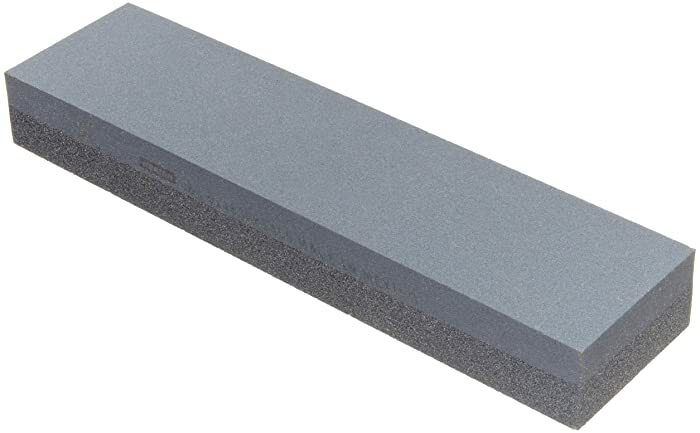 If you’re looking for a reasonably priced sharpening stone that also has good quality, this model is worth considering. It’s suitable for both beginners and experts. Size – It measures 7.25x2.5x1 inches. It’s 7.25 inches long, 2.5 inches wide, and 1 inch thick. Combination Grit – This 2-in-1 sharpening stone carries a 1,000-grit on one side and 6,000-grit on the other side. Stand – A plastic stand or holder is included in the package. The rubber feet will help keep the sharpening stone stable while being used. Water is Required – The instructions say that only water should be used to lubricate the sharpening stone. It specifically instructs users to soak the 1,000-grit side for only 2 to 3 minutes. As for the 6,000-grit side, it only needs to be splashed with water from time to time during use. As the Top 3 entry on this list, this model of the sharpening stone is good and will prove to be useful for people who regularly sharpen their knives, scissors, etc. The grit combination is great for maintaining and finishing the edges of cutting tools. Coming in at number 2 on this Top 5 list is a double-sided sharpening stone that’s very affordable. Check out its features and see if it suits your needs. Size – This is a 7x2.4x1.06-inch model of sharpening stone. Its total length is 7 inches, its width is 2.4 inches, and its total thickness is 1.06 inches. This model landed on the Top 2 spot mainly because of its combination grit. 600/1,000 is a good combination of grits for a sharpening stone because the 600-grit side is very effective in sharpening really dull cutting tools. As for the 1,000-grit side, it’s fine enough for finishing touches. As the sharpening stone that made it to the number 1 position on this Top 5 list, this model is definitely more impressive than all the other units mentioned above. Size – This Smith’s model measures 6x1.625 inches. It is 6 inches long and less than 2 inches wide. 3-in-1 Design – 3 sides of sharpening stones that are installed on a rotating plastic triangle will allow for the use of 3 types of grits in one setup. Grits – This unit comes with 400/600/1,000-1,200 combination of grits. Sharpening cutting tools on all 3 types of coarseness/fineness will result in a very efficient sharpening procedure. Angle Guide – An angle guide is included in the package. This can be clipped on the outer edge of a knife to achieve the right sharpening angle. Oil or Water is Needed – For lubrication purposes, you can either apply oil or water when using this sharpener. The size is not too big and not too small. It is capable of sharpening long knives and is also portable enough to be carried around. I consider this unit to be the best among all the models taken up here because it comes with an ideal grit combination. 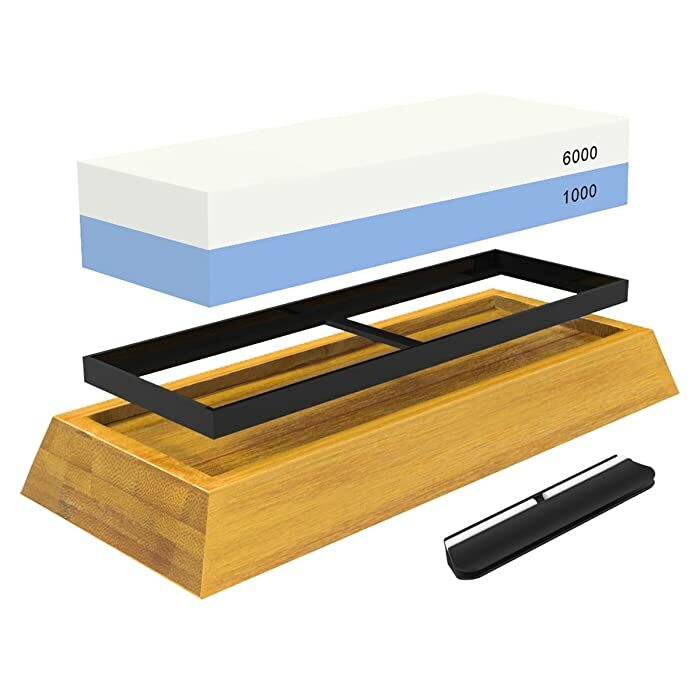 While most sharpening stones only have 2 sides, this model has 3 sides that you can use to gradually sharpen your cutting tools. Its features and design also make it suitable for both beginners and experts. How fast do you need to cut through the metal blade? How fine of an edge and how sharp do you want the blade to be? What is the most applicable grade of grit do you need to achieve your goal? How long are your cutting tools? Is it for home use or outdoor use? If you are going to sharpen knives, scissors, clippers and straight razors, all the products listed above are suitable for such purpose. Click here to watch a video on the clipper blade sharpening stone. And to use the product as a straight razor sharpening stone, click here (video). As you can see in the Top 5 list of sharpening stones, the Smith’s model captured the Top 1 spot. Of all the products featured here, I recommend this particular model because of its overall features and design. You will notice that the Smiths is the only one with a 3-in-1 design. It also comes with a good combination of grits – and the size is good for home use and outdoor use as well. As for the price, it’s reasonably priced and worth every penny. Also, i think you might like the sharpening steel instead of stone, check this ﻿sharpening steel reviews for your knives. It's an alternative to sharpening stone.